Dolly Parton wears many hats on her famous wigs—singer, songwriter, musician, producer, actor, theme park owner, and philanthropist. But she says one of the titles that means the most to her is “book lady.” Parton’s Imagination Library charity works with United Way, Rotary International, and library foundations and Friends groups to deliver more than a million free books each month to kids from birth through age 5—up to 60 books that they can keep. Imagination Library, launched in Sevier County, Tennessee, in 1995, will deliver its 100-millionth book in early 2018. American Libraries spoke to Parton, who released her first children’s album, I Believe in You, in October; proceeds benefit Imagination Library. There are so many ways to promote reading and literacy. 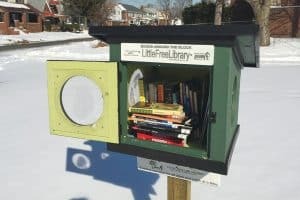 How did you decide to set up Imagination Library this way so that children get free books in the mail that they can keep? It started out with a simple dream, and a very personal one, 22 years ago. My father was a brilliant man, but he never had a chance to go to school. Daddy couldn’t read nor write, and it always just seemed to cripple him, and he was embarrassed about it. So it inspired me to start the program. We started it in our home county—I was just going to have this little program where we gave books to children. From the time they’re born, they get a book once a month in the mail with their little name on it. When they’re able to walk, they love to go to the mail and get their little books. It’s just something to inspire them to read. My dad was very helpful in the early days with me. I tried to involve him as much as I could. He passed away in 2000, but he got to live long enough to see it doing well. It did so well that it went all over Tennessee, then all over the United States, then into Canada and different parts of the world. One of the things I’m proudest of is that we are getting books to children in Alaska and places where kids only get supplies once a month on boats or planes. We’re giving books to kids who wouldn’t have a chance to get them otherwise. A lot of people think this is just for poor children—it’s for all children. It’s important to get books into the hands of any child that we can. How do you choose books for the program? I don’t choose them myself—we’d never take that on ourselves. There’s a whole committee of people who are the intelligent ones, who know what is child-friendly and age-appropriate. I’m just happy to be the one to help generate money and excitement. You have 11 siblings, and your father never learned to read. Did you have books in the home? What was your access to books like when you were a kid? We couldn’t have too many books in our house. Daddy always said, “Don’t bring these books home from school because I can’t afford to pay for them.” We had so many little kids—they’d chew them up, tear them up, pee on them, or whatever. The main book in our house was the Bible. My mama used to read it to us. And we would read at school. As soon as I could get my hands on anything, I loved to read. I still do. We didn’t have the Imagination Library growing up, but it would have been nice if we had—we had enough kids, we would have had plenty of books in the house! We were in a country school, so we didn’t have a library there. Mostly we had the books in the schoolroom. When we went to high school, we had access to a library. I loved all the fairy tales, but one of the books I remember first and the one that made an impression on me is The Little Engine That Could. And now it makes an impression on lots of kids because it’s the first book that we give away. I based the song “I Believe in You” on that book. I’ve always related to that book because I think I’m the little engine that did!